I love bold and simple shapes, and what’s lovelier than a big, red heart? 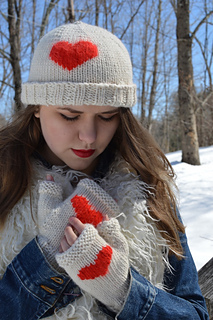 How about two big, red hearts, worked in simple duplicate stitch? The gorgeously soft & fluffy Belangor French Angora makes a perfect statement on these soft and cozy mitts! This pattern is one that I use for teaching the Magic Loop method of knitting in the round and simple paired increases and decreases. Quick to knit, these mitts make a perfect gift for a special friend – or keep them all for yourself! Designed to be worn with the matching Champagne Heart Hat. Or yarn that knits to specified gauge. NOTE: MC is used held triple (3 ends together) throughout.